"I'm visiting a friend... we are not mistaken about Mikami. It could be that Kira ordered him to stop, keep following him, he's not very clever and he will make a mistake sooner or later." "Alright... keep me informed." And with that Near ended the conversation. He was going to have to find that security guy, whatever his name was. Near knew that he was the so called right-hand man of Mello. It might be smart if he informed Mello of his current activities. Near was packing his bags, lately Kira was very quiet and because of that he had only one thing to think about... Ani, and how she had left without so much as a note. Now he had planned to search for her, even if that meant that he had to travel all around the world. 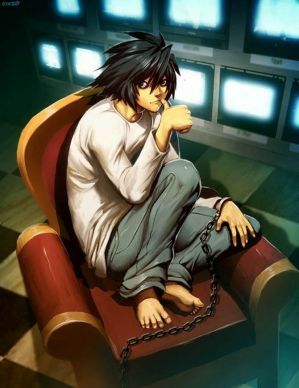 He was positive that L could handle the Kira case alone, after all he had been able to do so before, and besides the SPK would still continue the investigations. Near slowly walked into his bedroom. It had remained exactly the same way as he had left it, two years ago. Which included all the memories of Ani. He took the picture of him and Ani that stood on the bedside table and wiped the dust off. "A small part of me had hoped to find you here. Crazy thought, huh?" He said to the picture. From his pocket he took a small item and stared at it intently. "But then again, I'm sure you would not have sent this to me. If your feelings had changed I'm sure you would have told me in person." In his hand he held a small silver ring... the same one he had given to Ani in this room when he had told her just how much she means to him. As Fey placed her cellphone back upon her side-table, she took notice of the mumbling through the wall beside her. It had been a while since she'd heard any kind of voice near her room, mainly because Near had only just returned, and it was neighboring with hers. She couldn't really make out what he was saying, but she could definitely conclude that he was talking with himself. She knew it wasn't right to listen in (a little creepy as well, to add), so she simply sighed and headed off to bed. She felt sorry for the guy. He didn't know how long he had been lying awake, despite the jetlag, just staring at the ring which glimmered lightly in the faint light. However eventually the exhaustion won and he fell asleep, still fully clothed with the ring resting in his open hand. When the darn alarm clock sounded, Fey's hand slammed it shut, groggily pushing herself up from the nice and plush bed as she stretched every muscle in her body. The tiredness in her eyes made her extremely slow during the mornings. As she walked outside and headed to the "bathroom", she had realized that the bathroom really didn't have a bed or other furniture often found in a bedroom. She stood there for a little bit and rubbed her eyes, spotting the familiar sight of white hair, matching the attire he wore. Like it was completely natural, the violet-eyed girl walked over and swiftly threw the covers over the boy, subconsciously ruffling his hair. "Nighty night."